MOORPARK, CA, October 17, 2017 -- TestEquity LLC, a one-stop, value-added provider of premium electronic test and measurement equipment and eMRO tools and supplies, today announced its new, expanded 2017-2018 Tool Kit Guide. JENSEN offers more than 300 pre-assembled kit solutions for various manufacturing and field service applications including the new military focused GMTK and SARK kits. "TestEquity has invested significantly in the JENSEN tool kit business, which has allowed us to leverage our expertise and broaden our exposure to markets outside of our traditional electronics field service heritage," said Ray Bellavance, Director - Tool Kit Business at TestEquity. "Our tool control and tool kitting expertise can benefit any manufacturing organization, military/critical field deployment application and field service technician looking for efficient tool utilization and accountability. We know it’s critical to have quick access to every tool necessary for the job, and we can custom build any tool configuration, case style, pallet option, cabinet or drawer system for your industry-specific needs." "The recent Techni-Tool acquisition further expands our pre-assembled kit offering," added Bellavance. "With over 60 years of experience under our belt, JENSEN is your best option to provide field-tested and quality guaranteed tool kits. Look for the JTK® registration mark that signifies an original JENSEN® design." For more details and to see the latest version of the JENSEN Tool Kit Guide, please visit JENSEN’s web site at www.JensenTools.com. 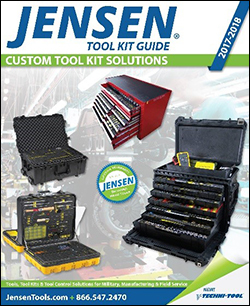 Information about JENSEN tool kits and the custom kitting solutions can be requested by contacting JENSEN Tools + Supply directly at news@jensentools.com or by calling 800-225-5370. TestEquity is a leading value-added provider of Test Equipment, eMRO Tools & Supplies and also designs and manufactures its own line of Environmental Test Chambers in its headquarters in Moorpark, California. As a customer-centric business with highly trained and experienced product specialists across the United States, Canada, and Mexico, TestEquity helps businesses by providing the industry’s top brands together with innovative products and unparalleled customer service.